Disneyland is undeniably one of the most enchanting, friendly and magical holiday resorts in the world for both adults and children. Why not see in the New Year with Mickey Mouse, Donald Duck and company..? Book one of the amazingly affordable holiday deals on offer at this present time and you will be guaranteed to make memories with your friends and family that will last forever! Celebrations are a regular occurrence at Disneyland Paris and the atmosphere is always alive with fun and enjoyment - so it is quite right to assume that New Year's Eve really is treated as an extremely special occasion. There are more than one million shimmering Christmas lights beautifully decorating the resort and Disney's own snow makes everywhere look like a magical winter wonderland. New Year's Eve at the resort also equates to the on-site restaurants giving holiday markers very competitive rates on sumptuous New Year dinners - it is advisable that you book your meal as soon as possible to avoid disappointment. You might like to head to the New York Hotel and eat in the Manhattan Restaurant or... Disney's Hotel Cheyenne where you can enjoy an extravagant meal at the Yellow Rose. There are so many forms of accommodation to choose from at Disneyland Paris. Head to the up-to- the-minuet and extremely comfortable Residhome Prestige Val d'Europe which is popular with holiday makers and business workers all year round. Situated in a plush business park, Residhome is five minutes away from Disneyland and all its attractions. With so many brilliant holiday deals on offer do not regret missing out. 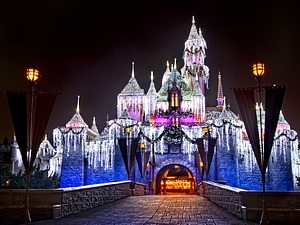 The iconic Sleeping Beauty's Castle is the chosen location for an amazing, world class firework display come midnight. Disneyland Paris holidays particularly at this exciting and poignant time of year really will leave you feeling as though you have been part of something really special.